A vehicle crashed into the The Hornet restaurant off 1st and Broadway - again. DENVER — For the third time this year, a car crashed into The Hornet restaurant at 1st and Broadway. 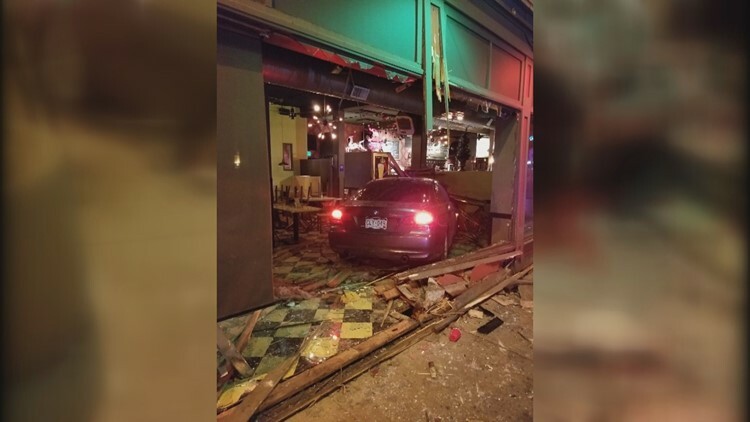 Hornet owner Sean Workman said the most recent wreck happened at about 2 a.m. Saturday when a car smashed through the restaurant’s front windows. At the time, several employees were inside working to close up, but luckily, no one was injured. Denver police have confirmed that the driver was taken into custody. “When the car came through, there were some staff members that were really close or had just walked by a few seconds prior to it,” Workman said. For the third time this year, a car has crashed into The Hornet restaurant on South Broadway. The last time a car plowed through the restaurant was just over two weeks ago. A similar incident also occurred on February 14 when a car sped out of control and went through the window. RELATED | The Hornet doesn't have a drive-thru. Stop driving through it! Prior to Saturday's wreck, the restaurant had put up plywood with spray-painted messages that read ‘not a drive thru.’ Workman said an incident like this happening so close to Christmas is extra painful. The Hornet will be closed for brunch on Saturday, but a portion of the restaurant may reopen for dinner by Saturday evening, Workman said. Denver police are handling the investigation into the crash.